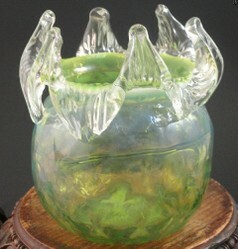 Rare pieces of antique Bohemian glass created by the Kralik glass makers intrigue art and glass collectors. Hunting through antique shops and flea markets looking for authentic Bohemian vases is a challenge that I eagerly take on. The talented glass makers who created these beautiful glass vases didn't believe in signing their names, nor did they use marks of any kinds. I have spent hours in libraries pouring over books to learn what a Bohemian glass vase looks like. It is quite different to see a vase in a book than on the shelf in an antique store. These experts spend hundreds of pages describing the difference between a Loetz and a Kralik. Many of them have been to Bohemia and visited the small museums that dot the Bohemian landscape. Each village or factory seems to have one. The antique vases are often donated by descendants of the glass makers. In the murky world of art and collectibles, this is probably the best authentication possible. The story of antique Kralik glass spans the period 1815 until World War II. It involves many generations of the Kralik family and the Boehemian art world. The European Union has issued strict standards for any glass that wants to use the Bohemian Glass label. It must contain 24% lead oxide. The scientific symbol for lead oxide is PbO. So when you see a tag or product descripton with 24%PbO in it, they are telling you that the product meets this strict requirement. The 24% PbO designation applies to modern Bohemian glass only. Bohemians began making glass around 1250. Even at that time, they used more lead oxide than the famed Venetian glass makers. The increased lead oxide levels made their glass more durable and gave it a distinctive feel. However, just because a piece of glass was made with 24% PbO doesn't make it valuable. That often depends upon the glass maker and design. That's the way it has always been. Historically, Bohemian glass makers often didn't sign their works or use marks. So, it can be impossible to determine which glass maker truly a piece of glass. When you see Kralik attached to a piece of Bohemian Glass, it is referring to the Wilhelm Kralik Sohne factory. Translated into English it means Wilhelm Kralik and Sons. This factory produced glass from 1815 until World War II. However, it wasn't always known as Wilhelm Kralik Sohne. In 1815 Josef Meyer founded the glass factory and called it Adolfshutte. During Josef's time he expanded the business to four factories. When he died his son Jan ran it until 1841. When Jan passed away, company ownership was divided among two of his nephews: Josef Taschef and Wilhem Kralik. They decided to change the name of the company to J. Meyr's Neffen. When Josef died in 1871, Kralik took full ownership. The name changed again to J. Meyrs Neffe. Wilhelm Kralik died in 1877 his four sons inherited the company. They decided to create two separate glass making companies. Sons Heinrich and Johan formed Wilhelm Kralik Sohne, while Hugo and Karl formed Meyrs Neffe. Meyrs Neffe later merged with Moser in 1922. Wilhelm Kralik Sohne continued on until World War II. When Karl died in 1899, his two sons Albert and Rudolph assumed control of Meyr's Neffe. They would become a very respected glass factory created pieces for famous designers such as Hoffmann, Prutcher, Lobmeyer and Bakalowitz. Meyr's Neffe was associated with very high-quality and innovative Bohemian glass. Wilhelm Kralik Sohne become known for glass vases with applied flowers, fruits and other decorations on the outside. It was considered less innovative and sophisticated than the glass produced by Meyr's Neffe. However, the best pieces produced by Kralik are now often marketed as Loetz. This is particularly true of pieces created in the Art Nouveau period. During that time, Loetz was considered the best Bohemian glass maker. Art Nouveau glass is often referred to as Jugendstil. Kralik would flourish during the Art Deco period and finally find its mature voice. Kralik Art Deco Vases are some of their more sought after pieces. If you find a Loetz masquerading as a Kralik, then you will pay a lot less for it. So it pays to take some time to learn the difference - or at least to make an educated guess. On eBay you can see some sellers have given up. They just refer to their piece as Loetz/Kralik. There is a lot of controversy as to whether these two glass makers ever teamed up. Most antique experts seemto think that they didn't. I love dusty old antique shops though and the stories that the shop owners have to tell. These are treasures. Finding them online is much easier than scouring antique shops. Add a beautiful touch of Asian decor to your home with an Antique Japanese Satsuma Vase. Some of the gorgeous designs include dragons, flowers and birds. A gorgeous selection of bronze Japanese vases to create an interesting and exotic home decor. Brilliant selection at fabulous prices.